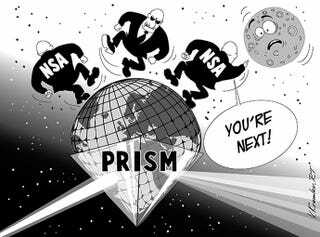 Want to be safe from the NSA's prying eyes? Here are some tips. Every day, we get new revelations from the Snowden Files that suggest the NSA has been spying on pretty much everybody's activities online. Now computer security expert Bruce Schneier has written up a few tips on how to make sure you're not one of the people they're watching. 3) Assume that while your computer can be compromised, it would take work and risk on the part of the NSA – so it probably isn't. If you have something really important, use an air gap. Since I started working with the Snowden documents, I bought a new computer that hasnever been connected to the internet. If I want to transfer a file, I encrypt the file on the secure computer and walk it over to my internet computer, using a USB stick. To decrypt something, I reverse the process. This might not be bulletproof, but it's pretty good. 5) Try to use public-domain encryption that has to be compatible with other implementations. For example, it's harder for the NSA to backdoor TLS than BitLocker, because any vendor's TLS has to be compatible with every other vendor's TLS, while BitLocker only has to be compatible with itself, giving the NSA a lot more freedom to make changes. And because BitLocker is proprietary, it's far less likely those changes will be discovered. Prefer symmetric cryptography over public-key cryptography. Prefer conventional discrete-log-based systems over elliptic-curve systems; the latter have constants that the NSA influences when they can. Read the rest over at The Guardian, and check out Schneier's blog post on the topic.